Everyone knows that driving or riding in an automobile is one of the most dangerous activities we do. And while rates of accidents continue to rise, cars are an essential component of everyday life. 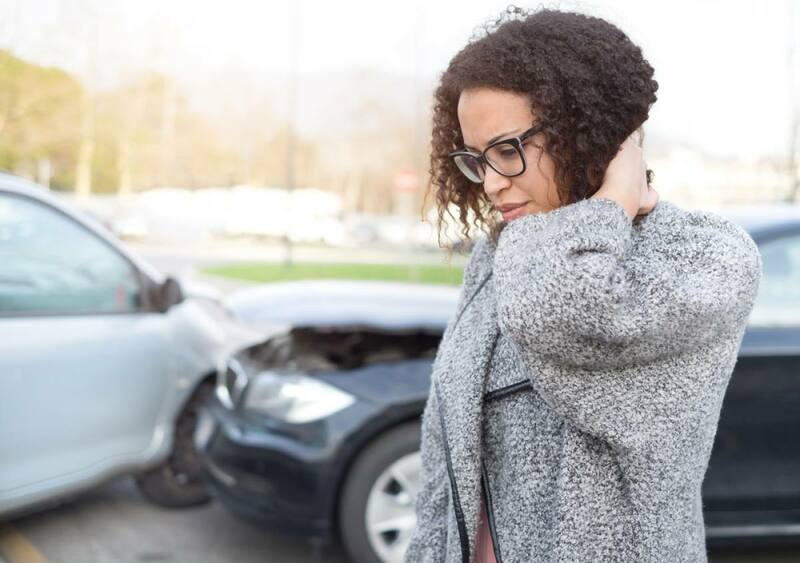 When you’ve been in a car crash, you need a skilled and experienced car accident lawyer to help guide you through the claims process and obtain the compensation you deserve. You need someone who takes the time to understand what makes you unique so they can advocate for the services that will get you back to living a life full of potential. Since opening our doors in 1951, thousands of Michigan families have trusted the Michigan auto accident attorneys at Sinas Dramis Law Firm with their car accident cases. Our lawyers are not only well-regarded in personal injury law with expertise in car accident cases, but have also earned the title of thought-leaders on Michigan’s unique auto no-fault system. We’ll help navigate your claim so you can focus on what’s really important — your recovery, healing, and life outside your case. Contact us for a free initial case evaluation and to see how we can help you. 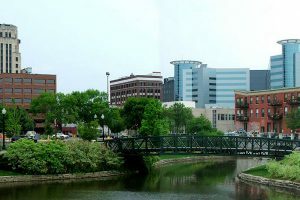 Headquartered in Lansing, Michigan, Sinas Dramis Law Firm opened its doors in 1951. Since then, we’ve become the leading authority in the area with regard to Michigan’s auto no-fault system, and have earned the trust and respect of our community members, peers, and clients. We love serving Lansing and are dedicated to protecting the rights of individuals and families injured in car accidents on Lansing roads. Our office is conveniently located near the I-496/US-127 interchange at 3380 Pine Tree Rd, Lansing, MI 48911. Get ahold of a Lansing attorney at (517) 394-7500. Learn more about our attorneys and Lansing office here. To better serve Michigan residents involved in car accidents in West Michigan, our Grand Rapids office opened in 2013. Led by auto accident attorney, Tom Sinas, Sinas Dramis is now proudly an influential auto accident authority in West Michigan. Every year, we help hundreds of West Michigan families obtain not only the compensation they deserve for their injuries, but also help connect them with the information, services, and resources that will aid their recovery. You can find us at 312 Fulton Street East, Grand Rapids, MI 49503. Get ahold of a Grand Rapids attorney at (616) 301-3333. With two main highways running through it, US-131 and I-94, the Kalamazoo area has its fair share of auto accidents. From daily commuters throughout the state, to traveling to Chicago or accessing the beautiful lakeshore, there is a real need for skilled auto injury representation in this area. In late 2018, Sinas Dramis Law Firm opened its Kalamazoo personal injury office to fill this need. 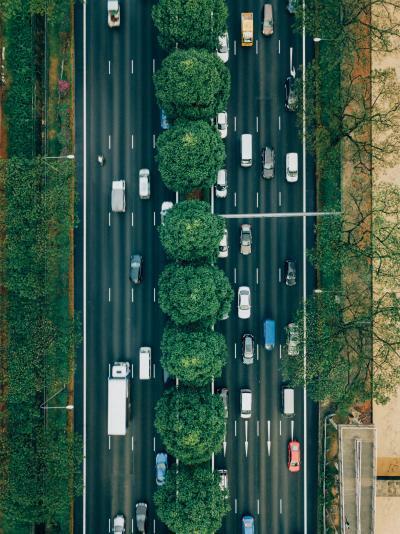 From semi-truck accidents, motor vehicle versus motorcycle collisions, and pedestrian crashes, our Kalamazoo office is ready to fight for your rights. Call our Kalamazoo location at (269) 443-8415 or contact us online to discuss your case. 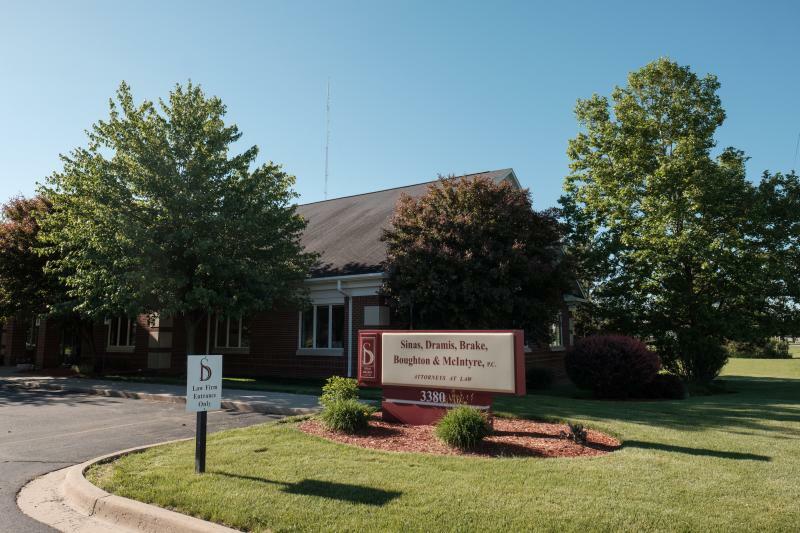 Our office is conveniently located right off I-94 at 4000 Portage St., Ste. 110, Kalamazoo, MI 49001. As Michigan’s largest metropolitan, car crashes in Detroit happen all the time. 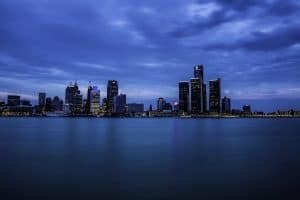 Understanding that accessibility is key for clients suffering injuries, pain, and life tilted on its axis, we proudly opened a location in Detroit in 2019. Our clients in Southeast Michigan can now easily connect with the superior representation we’ve offered for more than six decades. Our office in metro-Detroit is located at 24825 Little Mack Ave., Ste. 200, St. Clair Shores, MI 48080. Call our Detroit personal injury attorneys at (313) 202-2000 today. 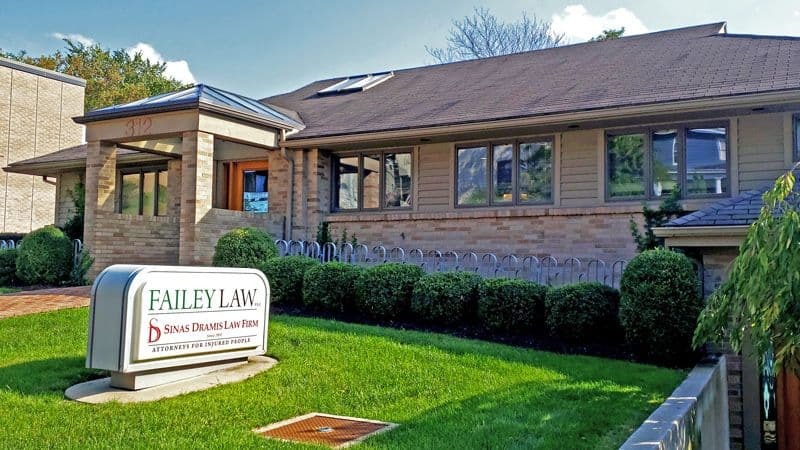 In addition to representing Michigan car accident victims, several of our attorneys are also licensed to practice in Illinois and we have a conveniently located Chicago office. You’ve been in a car crash. You’re probably pretty shaken up. It’s hard to know what to do first, what your responsibilities are, or what rights you’re entitled to. Below, our award-winning lawyers offer recommendations to help navigate this next phase successfully and ensure you are protected and taken care of. 1. Your first priority is your health and wellbeing. If anyone in your vehicle needs medical attention, a police officer can assist with getting an ambulance. Oftentimes, injuries from an automobile accident may not present symptoms immediately. These types of injuries include traumatic brain injury (TBI) and neck and spine injuries. If in doubt, seek medical attention right away. 2. Move over to safety. If your car is still operational and you can do so, navigate to a safe place off the shoulder of the road. Do not leave the scene of the accident. 3. Document and photograph the site. If you’re physically able to, collect as much information as possible. This may include photographs of the vehicles involved, your injuries, or videos of the scene. Furthermore, be sure to obtain insurance and personal information of the other driver. 4. Order your police report. At the time of the accident, you should have received information regarding which police department responded to your accident. Afterward, you will then contact that department for the official police report. 5. Contact a skilled auto accident attorney to begin a thorough investigation of the incident. 7. Do not speak with investigators or adjusters representing others involved in the accident or discuss the potential of settling or specifics about your accident. Also, do not sign any medical authorizations from the opposing party. Consult with your attorney first. Michigan is unique with respect to our auto insurance system. Below are some of the most common questions we hear about no-fault insurance. No-fault insurance, also referred to as personal injury protection (PIP), helps cover medical expenses and loss of income when passengers in automobiles in Michigan are injured in car accidents. These benefits are available to anyone covered by a no-fault policy (barring limited disqualification situations), regardless of who is at fault for the crash. This is what sets no-fault apart. Other types of auto insurance, such as comprehensive, collision, and liability, reimburse for damages depending on who is determined to be at fault for the collision. In Michigan, a no-fault policy is mandatory for all owners or registrants of motor vehicles in the state. What does no-fault insurance cover? Allowable expenses – A lifetime benefit for the injured with no cap. This benefit covers reasonable charges incurred from products, services, and accommodations for the injured person’s care, recovery, and rehabilitation. Work loss – This benefit pays 85% of an injured person’s previous gross income for up to three years when they are unable to return to work following their car accident. Subject to a monthly max of $5700 as of 2019. Replacement services – Reimbursement for services the injured person would normally have performed. Examples include household tasks and cooking, for up two-three years at $20 a day. Survivor’s loss – Payable for up to three years to the surviving dependents of someone killed in a motor vehicle accident. Grand Rapids car crash lawyer, Tom Sinas, explains some of the benefits covered under Michigan’s auto no-fault system. 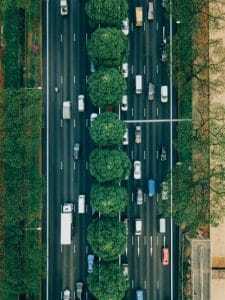 What are the benefits of no-fault coverage? Without a doubt, Michigan’s no-fault system is the most unique and comprehensive auto insurance coverage in the country. The main benefit of this system is simple. Regardless of fault, anyone injured in a Michigan car accident is basically guaranteed (barring a few, limited disqualification scenarios) payment of benefits under the no-fault system. When people are too injured to work and support their families, when children lose their parents suddenly in a fatal car accident, when the medical bills are piling up, there’s the most comprehensive insurance coverage in the country, auto no-fault. When someone is covered under no-fault auto insurance, whether it’s directly through them, a spouse, or a resident family member, they must turn to their own insurance policy for payment of no-fault benefits. However, there are some exceptions to this rule, found here. Non-economic damages – this includes pain and suffering as well as other quality of life losses. Excess economic loss damages – cover out of pocket expenses not covered by the no-fault claim. No-fault and liability claims, while two separate lawsuits, are intricately interwoven and the laws regulating them is incredibly complex. But not every attorney understands the complexities of no-fault insurance and how it works with liability claims. The attorneys at Sinas Dramis Law Firm have dedicated their careers to understanding Michigan’s no-fault system and are known as thought leaders in this area of law. As such, we dedicate an entire website to educating the public, fellow attorneys, and medical and insurance providers about this unique insurance system. We pride ourselves in skillfully navigating our clients through both types of claims – no-fault and liability – with the experience and dedication that have set us apart for decades in Michigan. If you or a loved one have been injured in an auto accident in Michigan, call us for a free initial case review at (517) 394-7500 or fill out a contact form here.